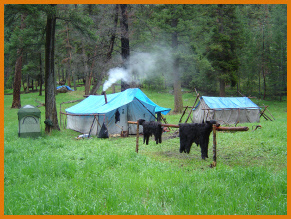 We offer horseback tent camp hunts for Black Bear and combo this with Wolf for an unforgettable week of hunting. 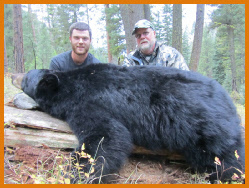 These hunts can be over bait (for bear) or spot and stalk, whichever you prefer. Bighorn offers a 2 bear area with reduced tags. Wolves are also at reduced tag prices with a bag limit of 5. Horse back hunts are all six day hunts; April, May and June. 1X1 $3,300 - 2X1 $2,350 ea. 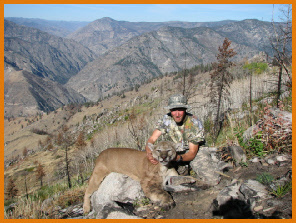 Hunting Mountain Lion is an exciting sport and our hounds man is an experienced and tireless hunter who will insure you a fine hunt. We offer hunts from both our base camp on the Salmon River or a fly in hunt on the Middle Fork of the Salmon River. These areas are known for their population of big cats. We do seven day hunts in December, January, February, and March. These hunts require lots of stamina and hunters should be in top physical shape. $5,800.00 plus tax - one hunter with 2 guides. Idaho is once again selling wolf tags as of May 2011. This all means we can offer hunts for this upcoming fall season. Hunts can be stand alone hunts or combo hunts with elk or deer and/or bear. 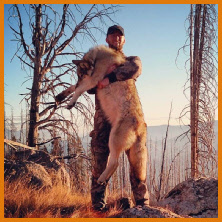 With wolf populations virtually untouched the hunting could be as good as it is going to get. Wolves are best hunted in the winter months. These hunts can be combined with a cougar hunt. We will also offer early spring float hunts for wolves. (Call for price). $4,300 plus tax-1 guide per hunter. $3,300 plus tax-2 hunters per guide. Lodging can be extra in winter months.